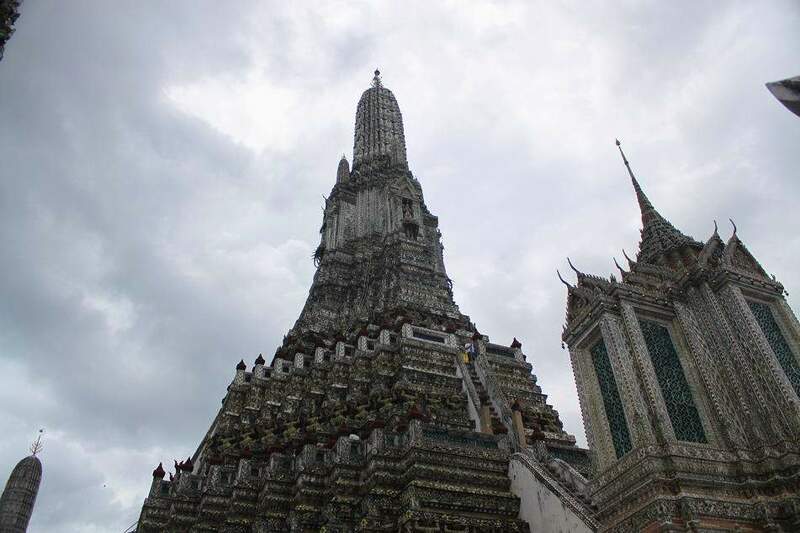 Wat Arun: The Temple of The Dawn | What an Amazing World! 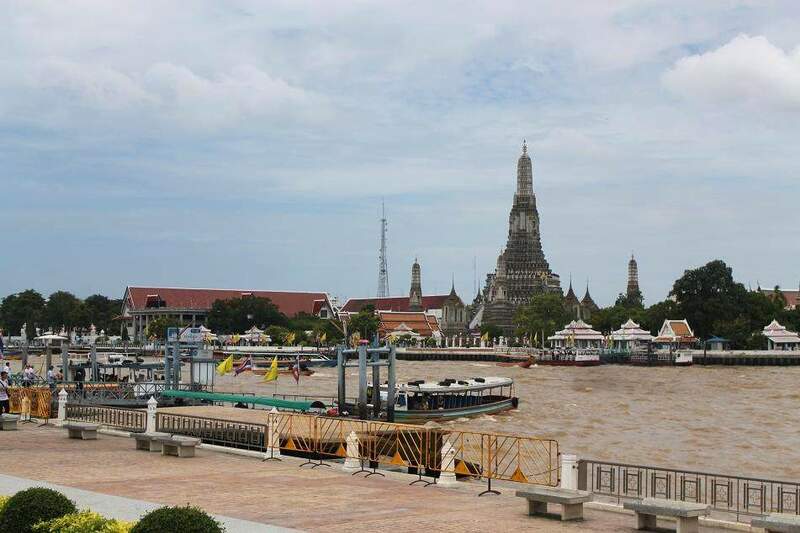 Wat Arun, which is located across the Chao Phraya river from Wat Pho, is also one of Bangkok’s most distinguishable landmarks. It was named after Aruna (The God of Dawn) and has some features of a Buddhist temple, such as the existence of a central tower (prang) which symbolizes Mount Meru (a mystical mount in Hinduism/Buddhism story). 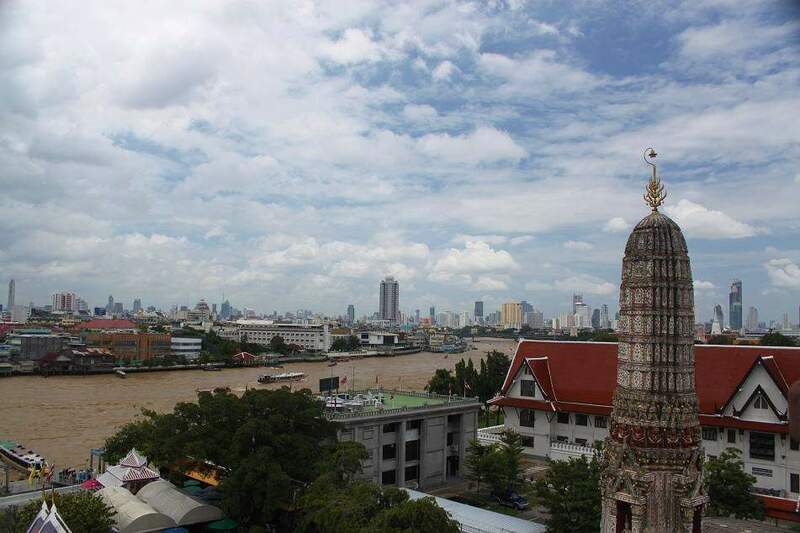 The temple can be reached from Wat Pho by crossing the Chao Phraya river by boat which costs merely 3 bahts. As soon as you get off the boat at the other side of the river, you are already in the larger courtyard of the temple. However, to enter the main temple (which is marked by the central prang) you need to buy a 50 bahts ticket. 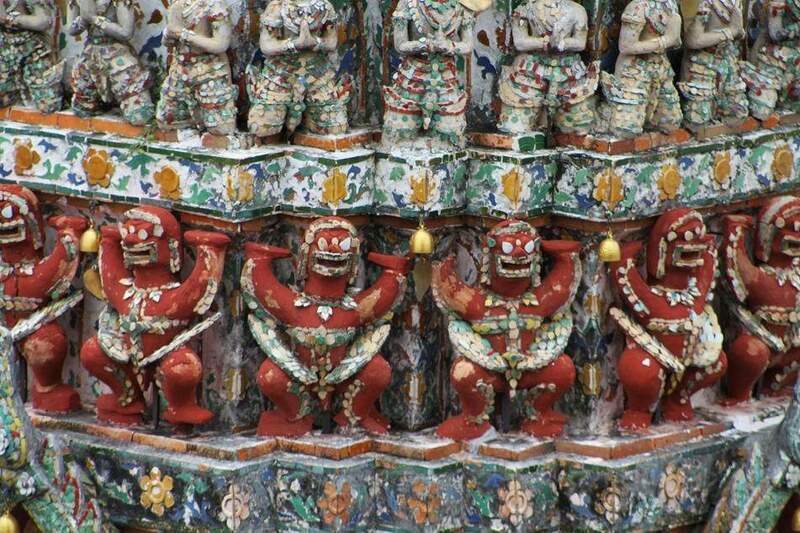 Although this temple has some distinctive elements which also can be found at other Buddhist temples, it has rather colorful reliefs. Most of the reliefs are also in the shape of flowers or plants (while in some Buddhist temples the reliefs usually depict stories of Ramayana or the king who built it). The main prang has three climbable levels, where the higher it goes, the steeper it becomes. Some people decided to quit climbing at the second level. However, if you manage to climb to the highest level you will find a long yellow cloth wrapping the prang. On the cloth, people write down their names as a proof that they were there or simply to express their satisfaction for having reached the highest level. You can see Bangkok’s skyline from here, which in my opinion is worth the climb. From what I have read, the best time to take photograph of Wat Arun is at dawn (perfectly suits the name, right?) when the sunrise shines through the silhouette of the temple. 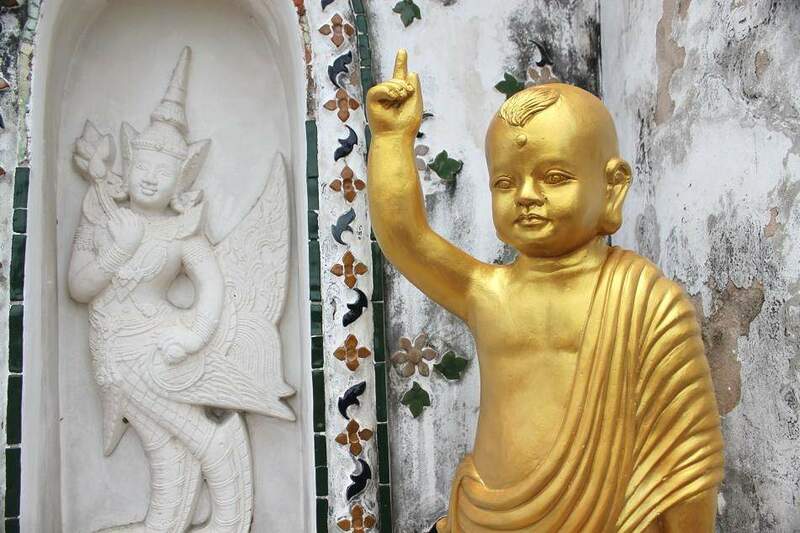 Pingback: Bangkok, A City of Many Faces « What an Amazing World! When I first saw the name Wat Arun I thought is was just suppose to be a catchy title. Didn’t know it was a actual place never heard of it before. Then I don’t do as much traveling as some. Great photos would love to visit Bangkok some day. Bangkok is a great start for your Southeast Asian travel and definitely worth a visit. Thanks for dropping by! Besides the temple, crossing Chao Praya River to get to this place by public boat was quite fun. So the next time you go I think you should try it. 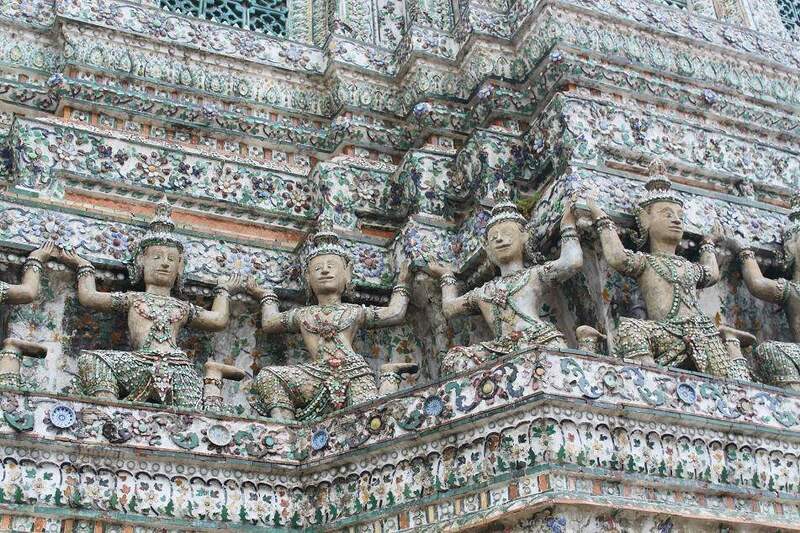 The detail on Wat Arun looks incredible! The last time I went to Bangkok, Wat Arun was covered by scaffolding. But that was more than a year ago, so I hope by the time you’re in town you’ll be able to enjoy this Buddhist temple with all its glory. As for Ayutthaya and Sukhothai, I’ve been dreaming to visit both sites. Somehow other places in the region seem to always drag me away from the ancient Thai sites. Hopefully in the near future I’ll get the chance to visit them. Enjoy your time in Thailand, Tricia! Thank you for the travel well wishes, Bama! If we journey to Ayutthaya and Sukhothai, I’ll share the tales on my site. Like you, we’ve also been to other places in the region (Cambodia, Laos, Vietnam), but have never given Thailand the attention I think it deserves. Is there anywhere else in Thailand you’ve been that you’d recommend?